Hold onto your seat as you watch professional white-water kayaker Adriene Levknecht compete in the Adidas Sick Line race. Adriene Levknecht hurtles over waterfalls and performs amazing acrobatic stunts in this video from Dagger Kayaks. 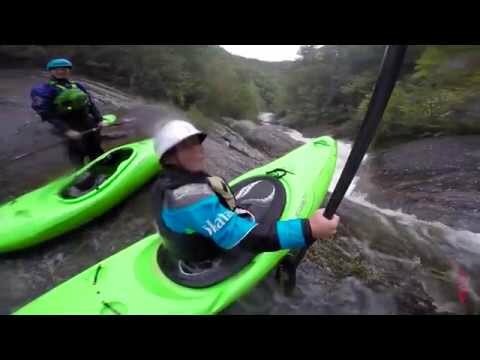 With professional white-water kayaker Adriene Levknecht, fear doesn’t stand a chance. In fact, it drives her. Conquering some of the most treacherous rivers on the globe, Levknecht earned her reputation as the top female kayaker in a sport dominated by men twice her size. Google her, and you’ll find jaw-dropping coverage of her hurtling over towering waterfalls and performing acrobatic moves on raging currents. Levknecht’s competitive mettle doesn’t stop there. When she’s not paddling, Levknecht brings the same spirit to her work as a paramedic with Greenville County EMS. Levknecht helps others conquer their fears with her work for First Descents, a nonprofit organization that provides outdoor adventure experiences for cancer survivors. See the videos above to watch Adriene Levknecht at play on some of the most extreme rapids on earth. For more on First Descents, visit firstdescents.org.